Upload your Halloween Costume Cutie photos before the end of the day on November 3, 2014 for a chance to win several prizes (see below)! Public voting takes place from 11/4/2014 – 11/5/2014. 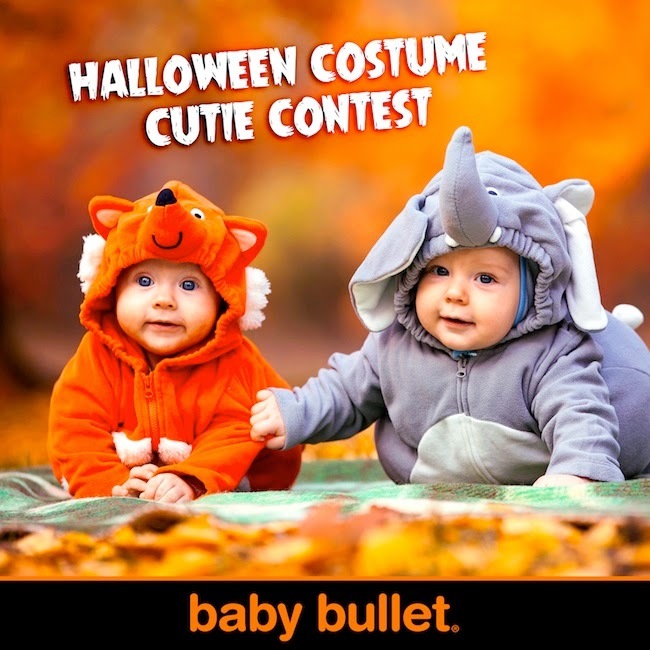 The photo winner will be determined by public voting and Baby Bullet staff voting and will be announced Thursday, November 6, 2014! First place winner (with the most votes) gets a NutriBullet Pro 900 Series and a SuperFood SuperPack (U.S. only), which includes a package of each: Superfood SuperBoost, SuperFood Fat Burning Boost, SuperFood SuperGreens, SuperFood Super Reds and their newest Superfood Protein Boost. To enter, you must be at least 18 years of age and a U.S. citizen or permanent legal resident (green card). Baby Bullet employees and their immediate family members are not eligible. Immediate family includes only spouses, parents and children. Final winner will be determined by Baby Bullet Staff. By entering the contest, entrants agree to have their submitted name displayed on our website and used by us for any purpose, at any time, without any fee or other form of compensation. We reserve the right to disqualify users, without notice, and for any reason.